One of my local grocery stores, Sprouts, keeps having pints of grape tomatoes on sale for $1.00. That's right, people, one buckaroo! So I keep buying grape tomatoes...not knowing what I am going to do with them but unable to pass up such a steal of a deal. The only unfortunate part is that the other day I looked in my fridge and I had 2 pints of grape tomatoes that have begun to wilt and wither. I let them pass the stage where they were perfect for snacking or throwing in salads or bruschetta so I had to get creative. I know you can roast just about anything to salvage it, so I figured, why not? I loved that these were super easy to make and had a nice sweet and roasted flavor. I'm sure you could also roast different size tomatoes too, like cherry or romas but you would need to adjust the roasting time accordingly. These were great on paninis but they would also be awesome in pasta or on a pizza! Preheat oven to 400 degrees. Line a baking pan or cookie sheet with foil. 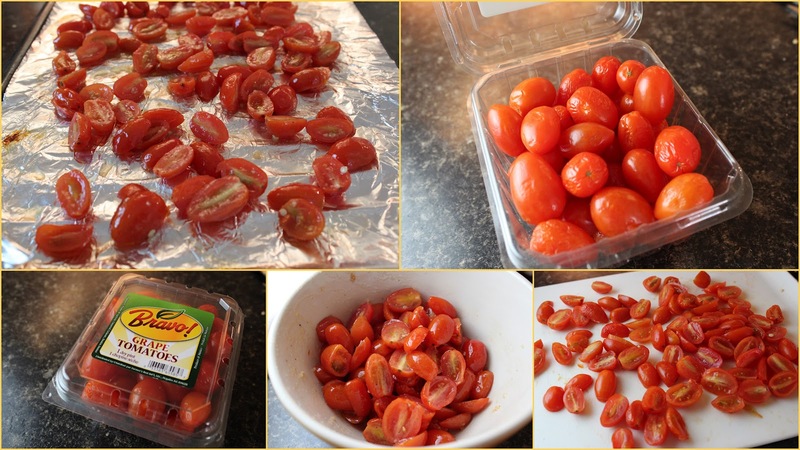 Wash tomatoes and cut in half. Toss lightly with olive oil, salt, pepper and garlic. Roast for 20 minutes, remove from oven and gently stir tomatoes. 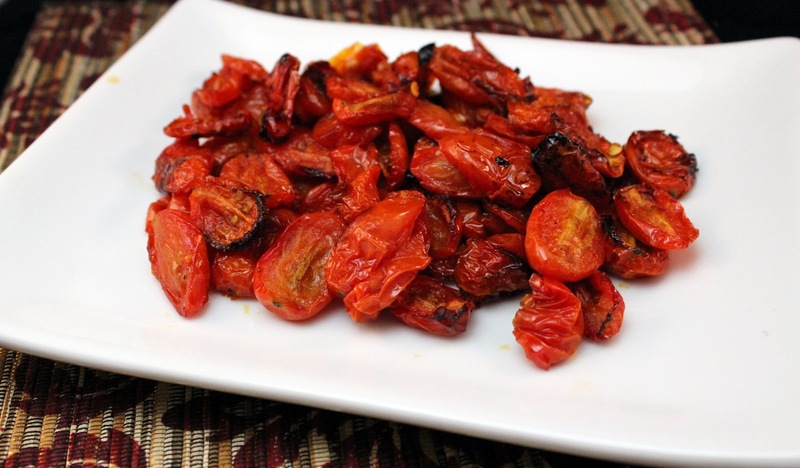 Return to oven and roast for an additional 20-25 minutes or until tomatoes are shriveled and beginning to blacken around the edges. Let cool before serving so tomatoes are not so fragile. Serve on sandwiches or pizza or in pasta!